For 2018 Yamaha took the wraps off the all new 210 FSH Sport and this boat is a game changer. The success of Yamaha’s 21’ sport boat models is unquestionable and gave the company a great starting point for this new package. Built in Vonore, Tenessee using craftsmen and women who specialize in fiberglass hull designs, Yamaha’s engineers are always in tune with creating the perfect combination of hull and engines. The 210 FSH Sport is a testament to the company’s total commitment to quality and innovation. The center console layout provides the operator with exceptional 360 degree views and with the twin TR-1 high output marine engines and driveline systems housed underneath the captain’s leaning post, the hull performs incredibly well. This list of standard inclusions is impressive and lengthy. All Yamaha sport boats are custom fitted to their trailer which comes in your choice of painted or galvanized. Inside the boat the first thing that struck me was the impressive T top which partners beautifully with a custom bimini for moments when we need a bit of shade. 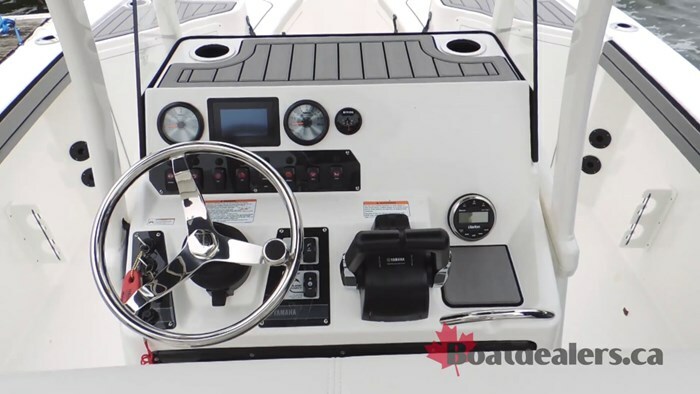 The helm design of this center console is user friendly and extremely functional; the convertible leaning post is ideally located for captain’s use and quickly converts to a stern fishing position, underneath the seat is a large removable cooler, there’s easy access to all switches and controls including No Wake Mode, Cruise Assist and the Jensen sound system, a locking glove box, a stainless steel sport steering wheel, an easily removable low profile windshield and a wide open area affording operators the ability to install their choice of flush mount electronics. Forward of the helm there’s additional seating and the console lifts open to reveal a cavernous curtained storage compartment that could easily accommodate a porta potti for those who desire this feature. For fishing fanatics Yamaha outfits the 210 FSH Sport with plenty of standard features as well. 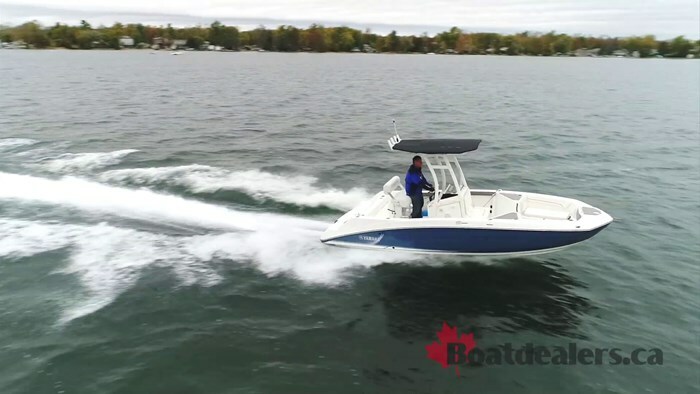 I found coaming pads port and starboard, a thoughtful combination of 18 rod holders in both vertical and horizontal positions, a 26-gallon aerated live well under the starboard bow seat and Yamaha’s exclusive JetWash system for quick and easy cockpit cleanup. 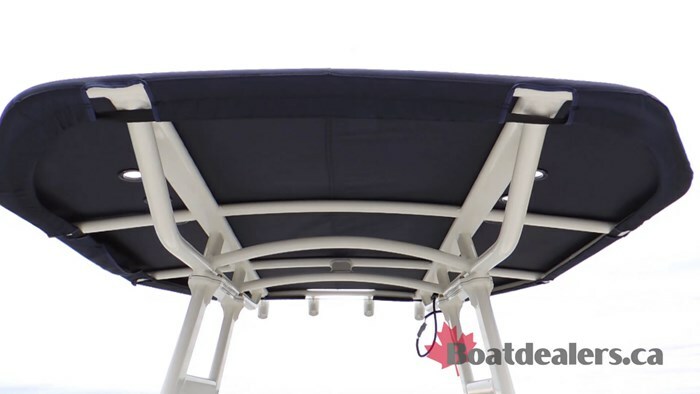 The bow section of the 210 FSH Sport is wide and comfortable with seating for 4 adults, an anchor locker large enough to store a full-sized Danforth anchor, more storage under the port bow seat. 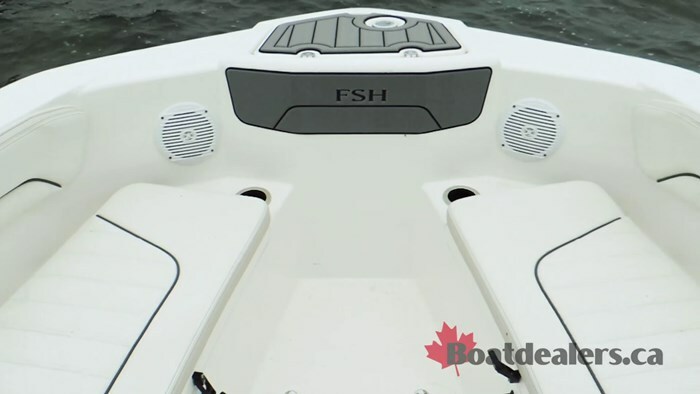 In total, the 210 FSH Sport features a very impressive 571 gallon / 2,161 L of storage. Unlike most center console packages, Yamaha’s jet engines allow their engineers to create a wonderful family section on the transom. Here you’ll find a wide open and luxurious seating area, a telescoping re-boarding ladder, a tow eye for watersports, access to Yamaha’s patented clean out ports and tucked underneath the stern is Yamaha’s Articulating keel which provides incredible straight-line tracking at all speeds. The package performs well with a pleasing 4.44 second hole shot and while we were carrying 2 adults and 40% fuel we found our way to a top speed of 49.2 MPH. More importantly was what felt like unlimited cruising speed choices. In our configuration, the boat handled well at both 22.4 & 28.6 MPH. 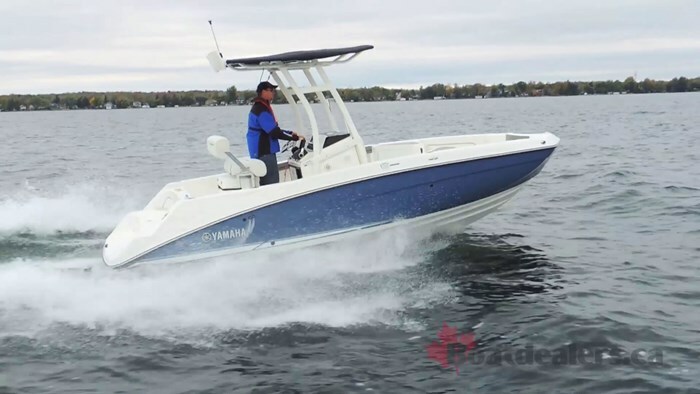 All in all, the Yamaha 210 FSH Sport is a very well-engineered and fun to drive package. There’s a very generous amount of room for families and an endless list of features for fishing.